From my standpoint, when Konami and Kojima had a falling out (allegedly the reason behind PT being wiped from existence and Silent Hills’ cancellation), a marketing tool was erased, not history. Granted, marketing experts will disagree, but I try to avoid ads, trailers and the like, whether they’re playable or not. As a critic, I’m supposed to criticize and interpret games through my experience with them. Marketing is against this approach. Marketing wants me, and everybody else, to believe in greatness before it happens. When it’s done poorly (or perhaps with sly intent), marketing can also cause us to harbor negative thoughts about an upcoming work. It is an enemy of discerning and open-minded criticism. Nonetheless, a lot of game criticism obsesses over bits of advertising as if they’re pieces of gold or full of clues waiting for a sharp mind to reveal their insight. Game journalists’ preoccupation with first impressions can be easily exploited. Look at the recent example of Destructive Creations, a no-name independent team that played political incorrectness for all it was worth in marketing the shooter Hatred. With the bar set this low, Konami and Kojima had to know PT would automatically be perceived as more sophisticated than a regular trailer. Now that PT is no longer available – unless you downloaded it and never deleted it from your hard drive – a marketing tool has become the stuff of legend, a mythical hype dragon spied only by the lucky few. In economic terms, this means that if you want access to PT you might have to spend several hundred dollars (if not a thousand) on eBay for a PS4 with the game installed. Or maybe you’re friends with one of the fortunate players that own it, perhaps letting you play it for yourself. Neither option appeals to me as a writer who would rather focus on games, not the various lead-ups to games. To my knowledge, my friends don’t have PT anyway. If they did, I wouldn’t be knocking on anyone’s door to fire it up. If anything, I would encourage them to sell their PS4. That’s what I would do. Another suggestion floating around is that PT should be re-released for a price, a possibility that raises philosophical concern. Thinking about a price tag on PT leads me to bitterness as I consider a future in which all pop game trailers are playable and purchasable, with game critics lining up to give awards to the best of this miserable breed, flooding Twitter feeds with the pride that comes from gaining access to a trailer – a trailer! – before everyone else. Given my bleak imagination, why would I dedicate any amount of payment or planning to gain access to marketing material for a project that is dead? 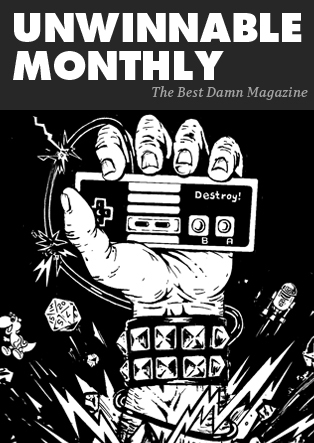 You’ve been reading an excerpt from Unwinnable Monthly Issue 48.